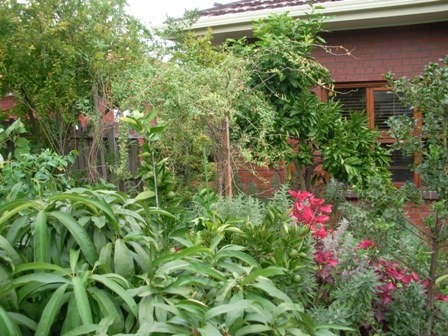 Here’s a picture update of the garden’s progress in early March 2011, the beginning of autumn in Melbourne, Australia. Pomegranates ripening, almost ready. When the spiky bits on the bottom of the fruit start curling inwards, they’re ripe! 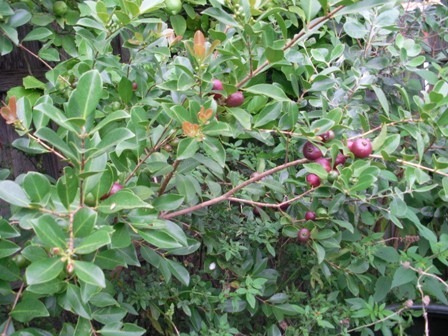 Cherry guava, also known as strawberry guava, are a tasty tropical fruit that can grow in cool temperate climates. Figs are starting to grow around this time, this one’s a tasty white fig with sweet red flesh inside. 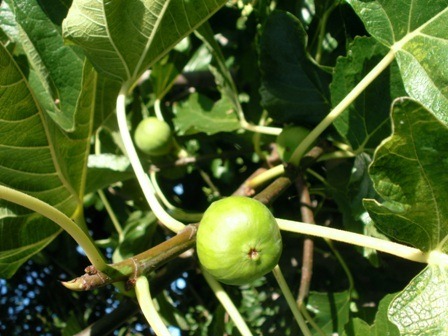 Drought tolerant Mediterranean trees such as the fig are ideal for hot, dry climates. 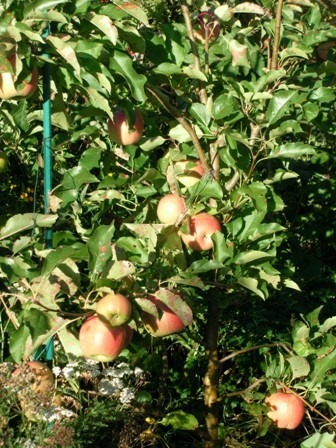 A young four foot high Pink Lady apple tree, laden with fruit in its third year. It produced a few kilos, and only six apples were lost to rainbow lorikeets (small parrots). 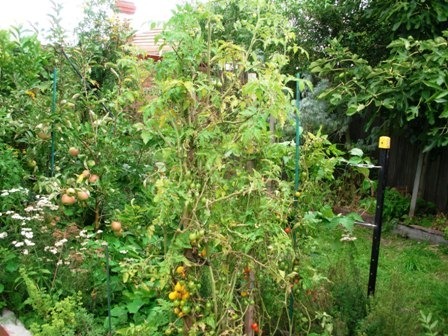 You can see the Pink Lady apple tree again here, nestled in amongst a heavily stacked garden bed, tomatoes in the foreground, and berry trellis with a youngberry vine growing at the rear of this garden bed. Another very young Gala apple tree, with it’s first apples. 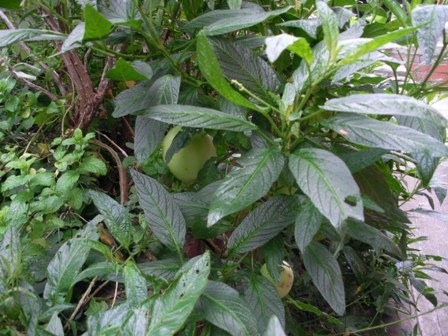 A Pepino, a small tropical melon, the lower one is much riper, beginning to turn yellow in colour. When they are ripe, they’re yellow coloured with purple stripes. They tast just like rockmelons, but grow to the size of grapefruit. They’re from the Solanaceae family (tomato family)! Perfect as a scrambling ground gover, or for draping over the edges of tall garden beds or terraces. 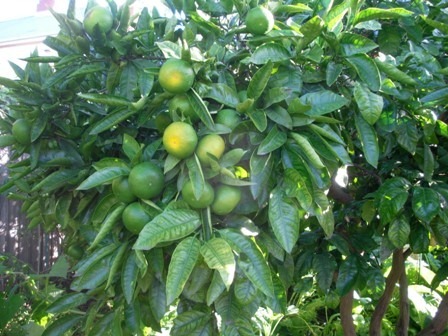 Mandarins starting to change colour, beginning to ripen. 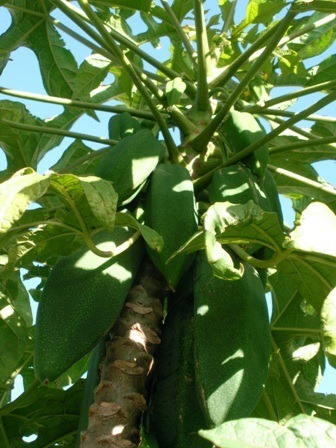 Yet another tropical, this time a Babaco, a relative of the papaya, with it’s fruit protected under the umbrella-like canopy. A closer look at the babaco fruit, when they turn golden yellow, they’re ready for eating. 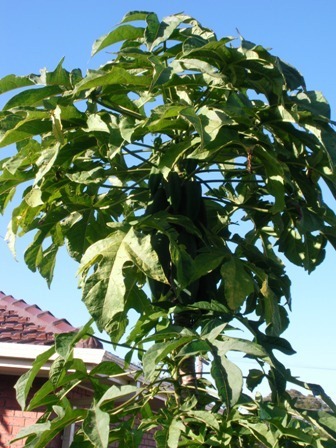 Here’s a baby babaco, three months old, with fruit emerging, propagated from a cutting, the only way to propagate this tree. 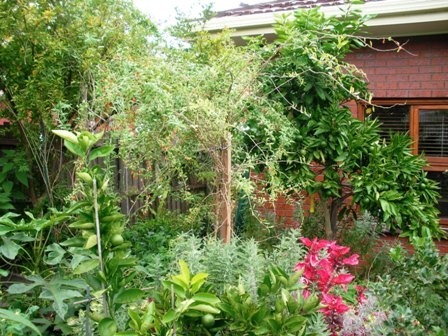 Make sure it is planted in well draining soil, damp soil will cause the roots to rot. This little fella came to grief this way, and was replaced by another in a drier part of the garden. 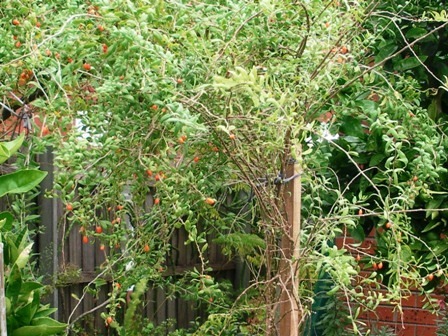 This plant with the weeping branches covered in little orange coloured berries is a Goji Berry. It is native to the Himalayas and inner Mongolia. The berries are literally day-glow orange in colour, and taste very sweet, and taste even better fresh than the dried ones you buy in health food shops. 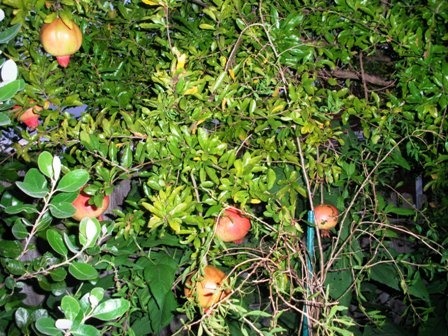 Extremely drought tolerant, they establish themselves and fruit after a year,after which, they survive anything. 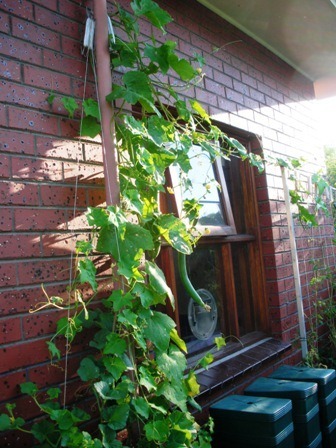 It’s not just fruit, here a some vegetables beginning to produce their yield, the Loofah, member of the cucurbit (cucumber) family, climbing up a string attached close to the wall. 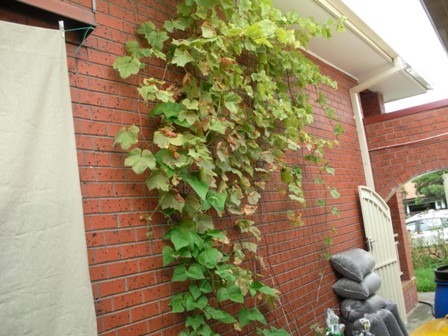 the warmth of the north facing wall extends the productive season, as it does for espaliered trees. 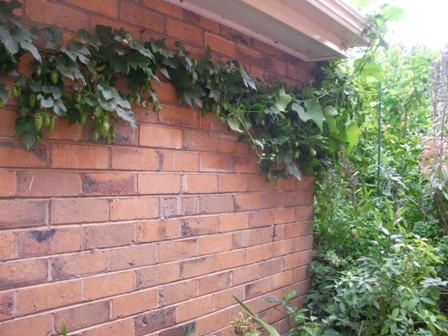 These are Hops, being trained along the garage wall, bearing lots of buds, which can be dried and used for beer brewing of course, or as a medicinal herb to assist in sleeping. 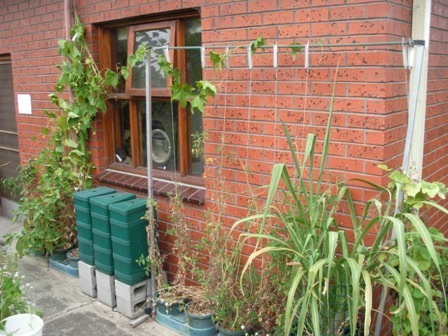 This is an example of how vertical space can be used to extend productive gardening space. A new trellis has been put in, much taller than my existing grapevine trellis which sits opposite it (not visible in this photo). I was going to put another grapevine on this one, but it’s too close to the trees behind it, so it’s going to become another berry trellis. 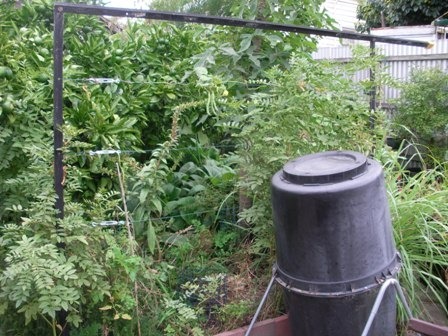 Licorice plant once again on the bottom left hand corner, and tall lemongrass behind the tumbler compost bin. 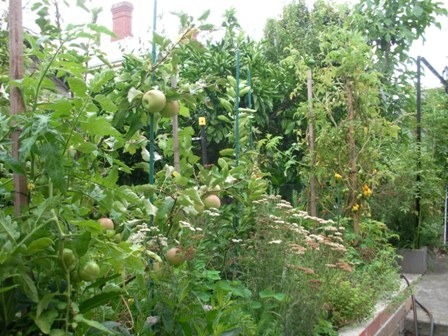 There’s no concern with how the trellises look when the plants are growing. 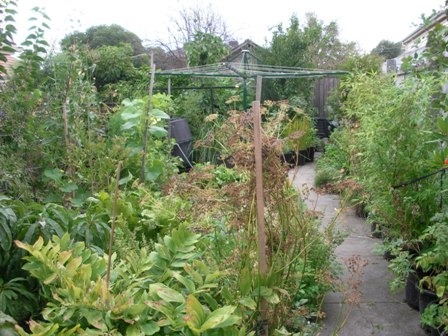 The raspberry trellis is on the right hand side of the photo, and it extends all the way to the fence at the back. 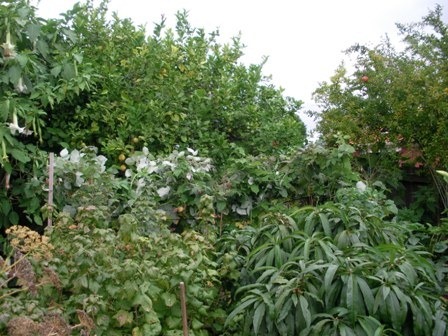 The raspberry canes have completely covered the trellis structure and wires. 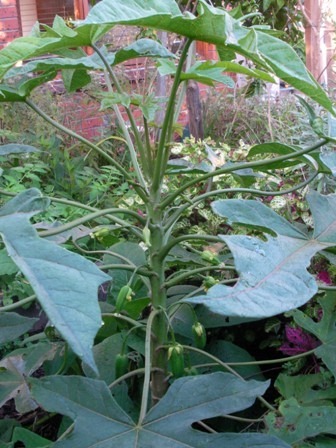 The tall plant in the middle, with the wide pointed leaves is a Yacon plant, a Peruvian root crop that is very high yielding, sweet, and can be eaten raw. 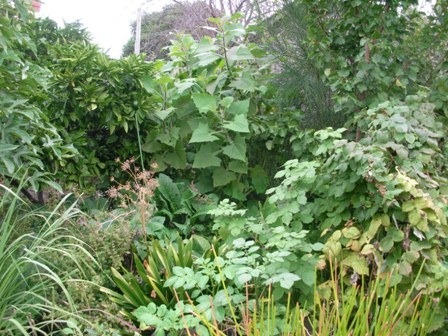 The light green reed-like plant in the bottom right hand corner is the container of water chestnuts. Garden view, the rest of the garden beds in the east side. Garden view, long distance shot, facing east. Garden view, even long distance shot, facing east. A close up of the same view. 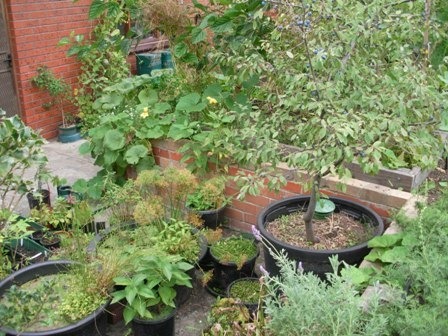 The container water garden area, with a Blackthorn (Prunus spinosa) tree in a very large pot on the right. 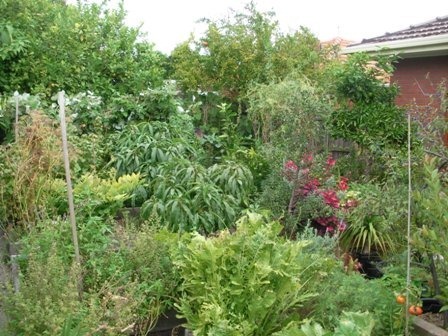 The summer heat has eased off a bit, and the garden is still in full swing, growing vigorously, looking lush and green. 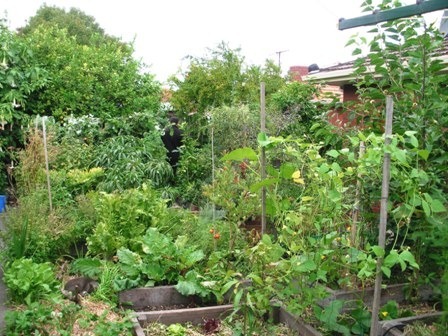 Even with the massive losses of produce this garden experienced from the extreme weather conditions brought on by the tropical cyclone that hit Queensland in early February (lost all grapes and stone fruit), the garden has picked up where it left off and is growing happily once again!